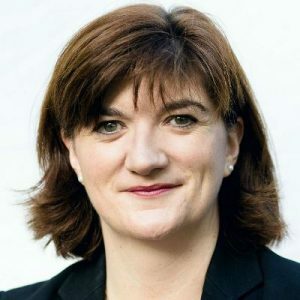 Nicky Morgan is the Member of Parliament for Loughborough and served at the heart of Government as a Whip, Treasury Minister, Secretary of State for Education and Minister for Women and Equalities. An outstanding and memorable speaker Nicky worked at the heart of the UK government during one of its most important political and economic periods and is a regular contributor to programmes such as Question Time, Marr, Daily Politics, Any Questions and other BBC Radio 4 and Radio 5live programmes. Her book ‘Taught not Caught: Educating for 21st Century Character’ was published on the 11th September 2017. Nicky served as a senior Cabinet Minister under David Cameron in both of his governments, responsible for Education, Women and Equalities, having previously worked alongside George Osborne at the Treasury, as Economic, then Financial Secretary dealing with the European Union economic ministers, 2012 Autumn Statement, and 2013 Budget. During her time in the Cabinet as Secretary of State for Education, and Minister for Women and Equalities, she oversaw the publication of the 2016 Education White Paper, Educational Excellence Everywhere, led negotiations for the Department’s 2015 Spending Review settlement and 2015 and 2016 Budget allocations, which at over £50 billion per annum, was one of the government’s largest. Nicky championed schools becoming academies, curriculum reforms which ensured young people are prepared for the world of work, the setting up of the Careers & Enterprise Company, the first Department for Education Character Awards and ensured there was specific ministerial responsibility, within education, for children’s mental health. She also led work by the Government Equalities Office on the introduction of the gender pay gap regulations, getting more women on the boards of listed companies and policies to address transphobic, biphobic and homophobic bullying in schools. Prior to this Nicky was a Government Whip in the Coalition Government and worked with Lib Dem colleagues to ensure the Government got its legislation through the House of Commons. At the start of the 2010 Parliament she was elected by her peers to be a member of the Business, Innovation and Skills Select Committee before being appointed Parliamentary Private Secretary for the Universities Minister. Before she became a Minister Nicky led a ground-breaking general debate in 2012 on mental health in the House of Commons. In her constituency she has worked with a group of volunteers to set up the Loughborough Wellbeing Café Project. Nicky Morgan was originally elected as the Member of Parliament for the Loughborough constituency in 2010 and was re-elected in 2015 with a significantly increased majority and largest vote swing of any of her Cabinet colleagues. She studied Law at Oxford University and spent 16 years as a solicitor in the City of London, mainly working in corporate finance and mergers and acquisitions. She trained at Theodore Goddard, spent almost 5 years at Allen & Overy and then worked as a professional support lawyer at Travers Smith. Nicky and her husband have one son, but when she isn’t with them, or working, she enjoys nothing more than a nice, long, run and completed the London Marathon in 2013 – pipped to the post by Ed Balls by only 13 seconds! Nicky’s main speech topics include general politics and the current political climate including BREXIT, the work of MPs and the House of Commons as well as education, preparing young people for employment and character education. She also speaks passionately about diversity and equality issues. Nicky enjoys sharing the lessons she has learnt from working in the male dominated worlds of law and politics, fighting for almost 10 years to get elected and sitting at the Cabinet table during a coalition government, general election campaign and EU Referendum. Interested in RT Hon Nicky Morgan MP?